Crystal Candy Silicone Lace Mat - Fishnet This pretty mat will should be used with Ed.. 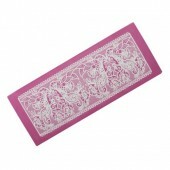 Crystal Candy Silicone Lace Mat - Graceland This pretty mat will should be used with.. 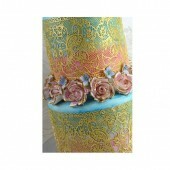 Crystal Candy Silicone Lace Mat - Midnight Garden This pretty mat will should be used.. 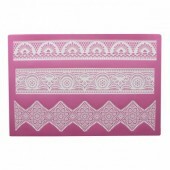 Crystal Candy Silicone Lace Mat - Paradise This pretty mat will should be used with .. Crystal Candy Silicone Lace Mat - Snowflake Swirls This pretty mat will should be use.. Crystal Candy Silicone Lace Mat - Virginia This pretty mat will should be used with E.. 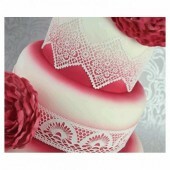 Crystal Candy Silicone Lace Mat - La Chandre This pretty mat will should be used wit..
Fairytale Romance Silicone Lace Mat by Chef Alan Tetreault This lace design consists of ..
Claire Bowman Art Nouveau Lace Mat A chain of interweaving love birds creates striking, art n..
Claire Bowman Peacock 3D Lace Mat This pretty mat will should be used with Edible Lace mix to cre..
Claire Bowman Fantasia Lace Mat Fantasia is an exquisite 3D dancing peacock lace design with inte..
Claire Bowman Ophelia Lace Mat This pretty mat will should be used with Edible Lace mix to create..
Claire Bowman Large Art Deco Lace Mat This pretty mat will should be used with Edible Lace mix to..
Claire Bowman Large Juliet 3D Mat The Cake Lace Juliet mat is inspired by the two iconic love bir..
Claire Bowman Large Eternity 3D Lace Mat This pretty mat will should be used with Edible Lace mix..
Claire Bowman Lace Spreader This tool is ideal for use with Edible Lace Mix and Mats. It will..